With their flying and their whistling and their regurgitating food. They’ve really got it made. It’s too bad you can’t fly. Cue the Superman music and check out Fly Your Body, a new shop that’s selling wingsuits, parachutes and other gear that makes jumping from high places a little safer, online now. Remember that guy who skydived from space... well, this store’s for him. 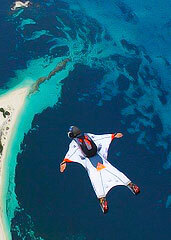 Also, you, if you’re into such things/feel a sudden need to take up a hobby like base jumping. Start by heading to the site, searching through their stock (wingsuits, canopies, altimeters) and adding a helmet to your cart (good lord, please get a helmet). Great, now you should have everything you need (minus the death wish) to turn yourself into a human rocket or make a dramatic rooftop escape from a bad date at Five Sixty. And if for whatever reason you’re not already a skydiving expert, well, that’s okay. Because these guys also offer classes. Just you, a trainer and some picturesque views of France. Oh yeah, the classes are in France.